I’m in denial that December is almost over… it’s one of the best months of the year and it always goes by way too fast!! I’ve mentioned before that we live super close to the mountains and I love how they look this time of year covered in snow! Despite the bitter cold temps (it’s been in the 20’s all week long!!!!) 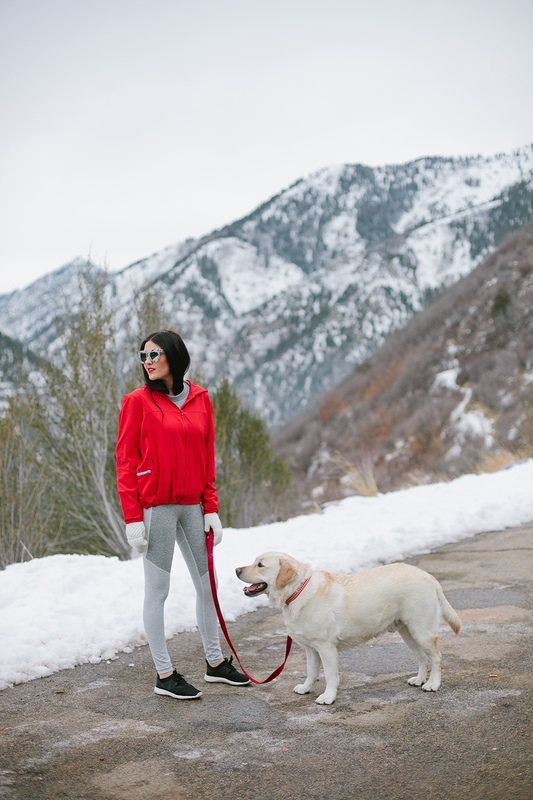 we took a drive up the canyon and let Dash run wild in the fresh, powdery snow. And boy, was he in heaven!! If you’ve followed me for a while you already know that one of my favorite things to do is take Isla Rose, Jackson and Dash out for a walk for some fresh air. Outdoor Voices is a really cool athletic apparel brand that provides a whole new approach to fitness with super cute clothing options! I especially love these leggings because not only are they super comfy, but the way they are sewn and stitched with the white and grey make me look skinnier than I really am ;) One of my goals for 2017 is to lead a healthy lifestyle by doing things everyday to be more healthy and active, so I think this outfit will be on repeat a lot in the coming months! Brought to you by Outdoor Voices. Cool leggings. I am a bit envious that you live close to the mountains. 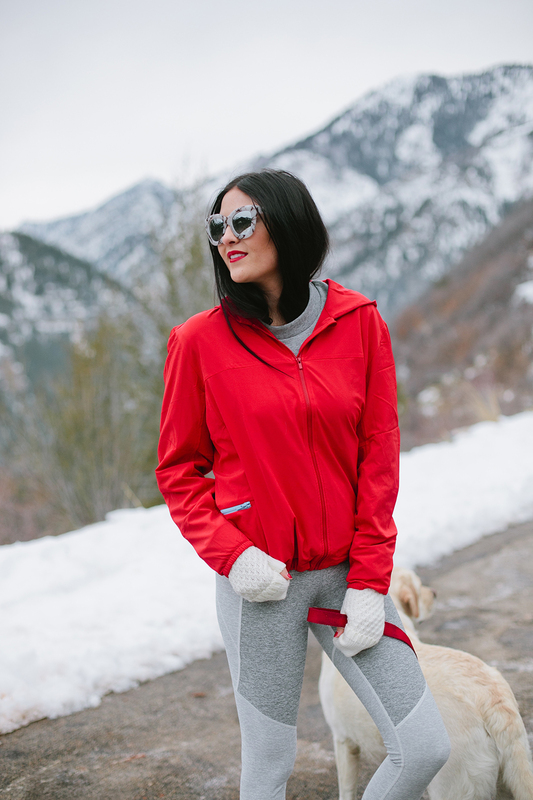 This is such a cute and stylish work out look, Rach; red looks SO good on you! I love those leggings and those marble glasses, such a nice touch to the whole look! Thanks for sharing and I hope you’re enjoying the remainder of the holiday season! So sad December is already coming to an end! Love this workout look! Great outfit. This was an awesome article I must say, although I did come across something similar on another site called Artisna.com. Their collection of online handmade clothing and accessories is simply mind blowing and I suggest you better check it out too. Peace! That is one of my goals as well! I am going to try and be healthier in the new year by drinking more water, being more active, and just all in all trying to lead a healthier lifestyle! Those leggings are so cute! It looks like you live in an amazing place! Get the latest updates, sneak peeks and more. Get the latest updates, sneak peeks and more on the Rachel Parcell Collection or new blog posts. You are now being redirected to the new Rachel Parcell website. Pink Peonies and Rachel Parcell Collection will be merging into one! We have created an even more beautiful experience for you to shop our product and browse the blog. We hope you enjoy our new design!